Early Satyricon is not well appreciated in these modern times where the band are better known for the Black Crow On A Tombstone video than for being one of Black Metal’s standard-bearers in the 90s. Yet you can always find a few crotchety kvlt types hidden in message board shadows willing to scoff at the band’s post-millennial output and proclaim the virtues of the first three albums especially, and digging The Shadowthrone out for another listen it’s hard to argue. I’ve learnt to love Satyricon’s modern grooving sound, but it’s not a patch on the days when the band were followers of sounds ancient, giving their early albums a ‘medieval’ folksy sound that, when done right, can produce some of the genre’s best offerings. And The Shadowthrone is most definitely done right. The usual duo of Satyr and Frost are here joined by Emperor’s Samoth on bass and additional guitars, creating a traditional yet powerful symphonic-backed sound. Synths on the album (played by Arcturus’ Steinar Sverd Johnson) are well-placed, even in interludes, and give the music a powerfully epic feel. As with the previous album, the music is carried by the transcendental guitar riffs, here more intense and interesting than the slightly amateurish feel that Dark Medieval Times can have. You can tell that the band’s wings were starting to seriously unfurl from that cover art, mysterious and atmospheric yet quite tasteful considering the year of release, and the music follows suite. It’s interesting to hear that even now Frost is upfront in the mix, unafraid of drum patterns divergent from the usual blasts, often throwing in little drum rolls or fills. Moments like the Viking chants, piano or spoken sections in Hvite Krists Dod show Satyr already precociously talented despite his relative youth (nineteen at this time) and those aforementioned folksy moments such as the sudden addition of lush acoustic strums to the cold atmospheric roar of Woods To Eternity are fascinatingly ahead of their time. Yet this album is Black Metal first and foremost, and it’s an example of the genre at its finest. The rampaging In The Mist By The Hills mixes aggression and strange, beautiful melody with the best of them, and Vikingland rivals early Enslaved with its male choirs. The nine-minute Dominions Of Satyricon is unabashedly epic, almost progressive in tone and compellingly hypnotic in true Norwegian style. Where Dark Medieval Times sketched out an image of the band’s vision, The Shadowthrone gives it colour and life, energy and power, ambitiously stretching beyond the genre’s roots to create something otherworldly and impressive even years later. 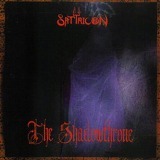 Many will consider it Satyricon’s greatest achievement, without a doubt a black metal classic and a vital purchase.